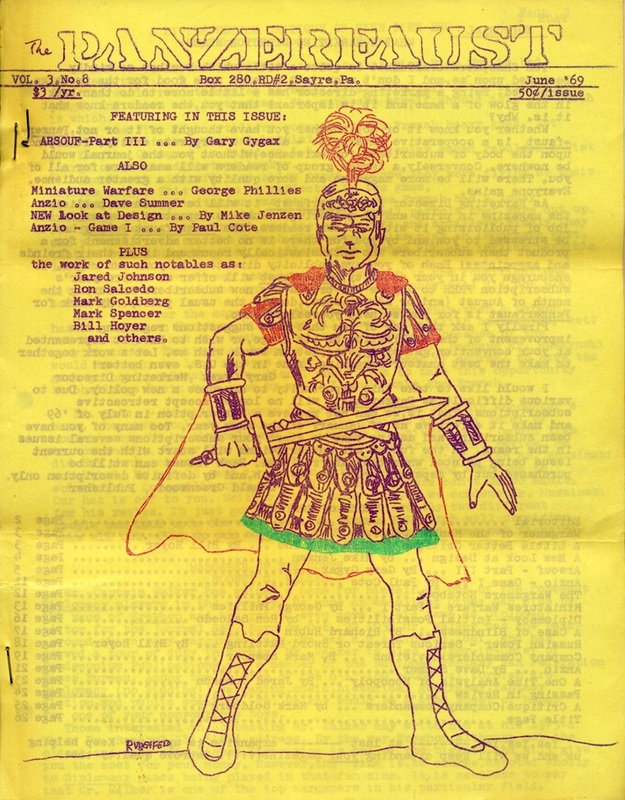 Years before the publication of Dungeons & Dragons or even Chainmail, the wargaming fan community knew well of Gary Gygax's aspiration to design games. 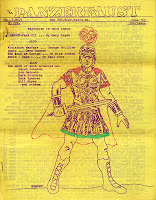 The image above shows the back of a copy of the April 1968 issue of Panzerfaust, an important early wargaming fanzine, which is hand-addressed to Gygax by the editor, Donald Greenwood. 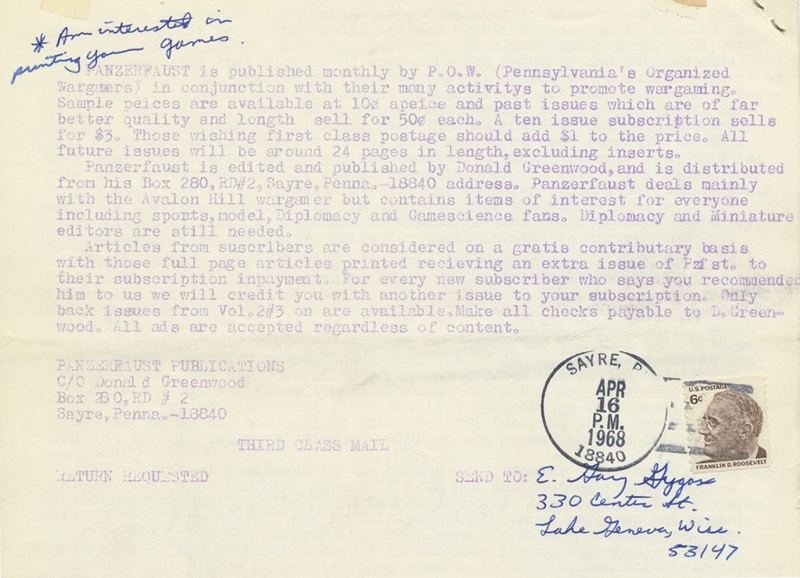 Of special note is the sentence Greenwood has jotted in the upper left-hand corner: "Am interested in printing your games." Around a year later, Panzerfaust would serialize Gygax's Arsouf (sometimes called Crusader), a medieval board wargame that represents Gygax's first foray into designs for that crucial setting. Arsouf depicts the twelfth-century Battle of Arsuf in the Third Crusade, a significant engagement between the Crusader forces of Richard I (the Lionheart) of England and the Ayyubid leader Saladin. Richard's victory that day dealt a significant blow to Saladin's campaign to remove the Crusaders from medieval Palestine, though ultimately Saladin would retain Jerusalem and thus thwart the Crusader's primary objective. When Gygax wrote up his description of the historical battle in the April 1969 issue of Panzerfaust, he stressed the disobedience of the mounted knights under Richard's command, and ponders the counterfactual outcome, "what if Richard's order for counter-attack had been obeyed and the entire Saracen force engaged...."
Historical wargames allow us to explore such alternative outcomes, and either side can prevail decisively in Arsouf. The game takes place on a long, narrow hex mapboard, 54 hexes long and 24 wide, representing an area of coastline just north of the Tel Aviv of today. The Crusader forces start in the northwest of the board, while the Saracens organize themselves along the east; the city of Arsouf is located in the far southwest, adjacent to a road leading south to Jerusalem. The terrain consists of a typical board wargame mix of woods, rivers, marshes, deserts, slopes and roads. The Crusader forces must reach Arsouf to win either a strategic or tactical victory, and similarly the Saracens must obstruct the Crusaders. A strategic victory can only be secured by eliminating the enemy commander: both Richard and Saladin were represented on the board by special pieces. In the unit counters shown above, Richard is the second from the left on the second row of the Crusader counters (the one which looks like an asterisk), whereas Saladin is the first counter in the first row under Saracens. Due to the limits of Panzerfaust's spirit duplication, in places the rules text and graphics can be challenging to decipher, and would require some conservation efforts to render the game playable. The core rules of Arsouf cover six pages in the June 1969 Panzerfaust. A turn represents one hour of action. Each movement phase is followed by an enemy archery phase. Separate combat results tables for melee combat and archery are given, both relying on the roll of a single six-sided die. There is however a prior table consulted for flanking or rear attacks which can easily result in a complete elimination of the attacked unit (thus, unit orientation in a hex is very significant in the game). In keeping with typical "shock" rules for the ancient and medieval wargaming settings, attackers are granted an impetus bonus when charging, especially for mounted units. Two other tables govern the morale of troops in perilous circumstances, and in a nod to the historical circumstances of the battle, mounted Crusaders may disobey orders to stand and instead charge archers under certain conditions. Finally, the system has a few more sophisticated wrinkles, including a split-move for horse archers and a rudimentary unit concealment mechanism to allow archers to hide in swamps. The serialization of Arsouf concluded in the July 1969 Panzerfaust with the publication of the map, which was segmented into six pages. Overall, the system departs less from board wargaming conventions than Gygax's earlier work on Arbela (1968), but unlike Arbela, Arsouf never made it beyond the amateur production means of Panzerfaust. Given that it represents a medieval wargame designed by Gary Gygax a full year before the founding of the Castle & Crusade Society, Arsouf preserves unique insights into Gygax's earliest thinking about medieval wargame systems. That's great. Of course, the observation about disobedient knights continued to be baked into Chainmail, AD&D's Cavalier class expansion, etc. Fascinating to see that there's a specific historical battle that originated that.